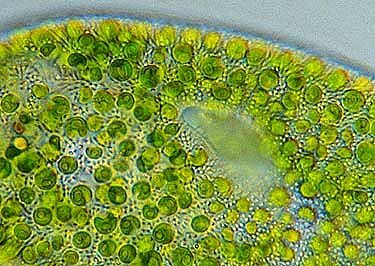 Chlorella is a single-cell green algae species that is grown in freshwater ponds in certain Asian countries. It is harvested and dried and is available as a supplement in the form of tablets or a powder. It is popular as a health supplement in Japan, and has recognized as a super food and wonder health supplement in Europe, American and Australia since it became more widely available. It is rich plant protein, and contains twice as much protein as spinach, about 40 times as much as that in soybeans, and 60 times that of rice. It is also a very rich source of nine essential amino acids that are very important for vegans and vegetarians. Chlorella is packed with a wide range on mineral, vitamins and phytonutrients, which contributes to the array of health benefits claimed for chlorella. Research studies have shown that it is effective in weight loss programs, and is helpful in controlling blood-glucose levels, Type 2 diabetes, and heart disease. It also provides many other benefits in preventing depression and boosting energy levels and in aiding digestion and help control diseases and toxins through its anti-oxidant properties and the way it helps maintain the immune system. 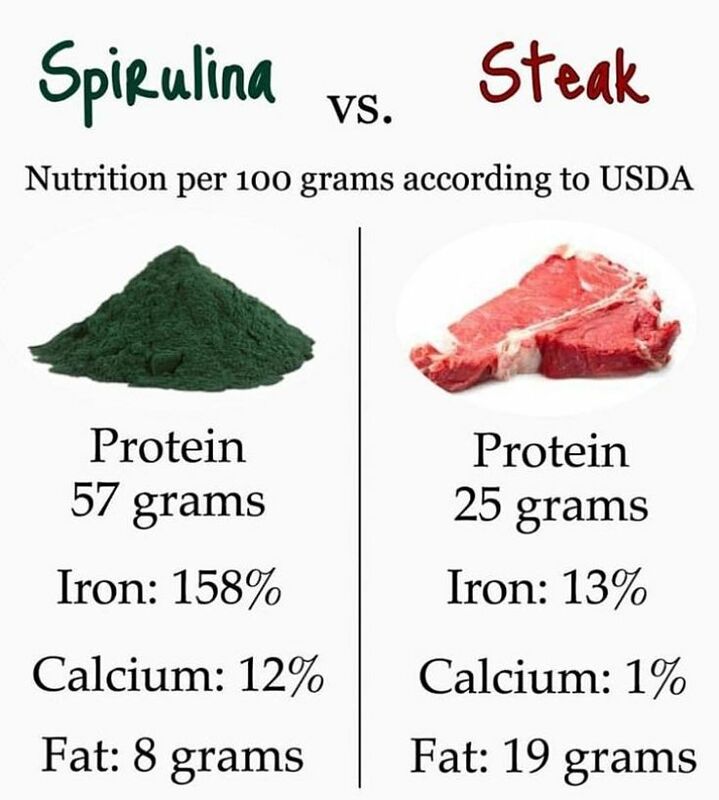 This article provides charts summarizing the nutrients in chlorella for a standard serving of 100g, and in comparison with other common foods that are rich in nutrients such as spinach, carrots, pumpkin and broccoli. 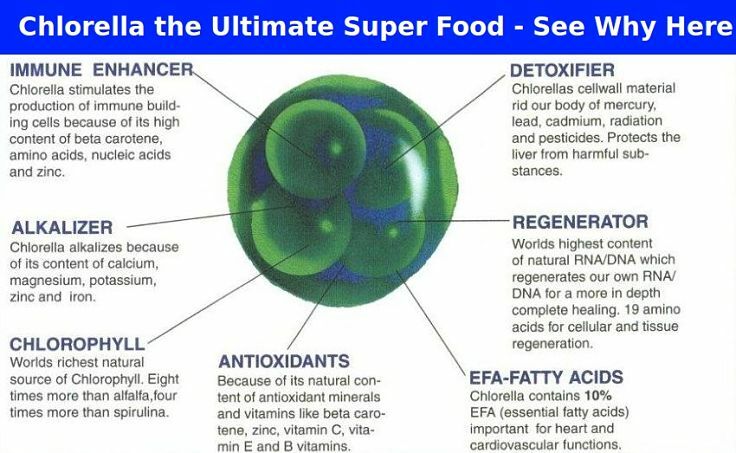 The health benefits of Chlorella are also reviewed and listed. 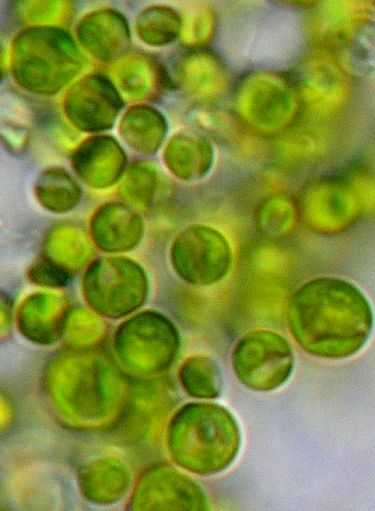 Chlorella is a small unicellular green alga only 3-8 micrometres in diameter. To prepare the cells for use as a supplement, they must be harvested, dried and crushed to breach, the tough cellulose walls of the cells. 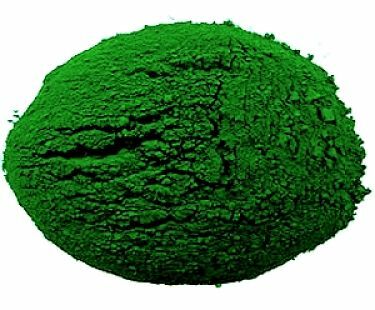 The final product is a fine green powder which can be eating as is, or is formed into tablets. Chlorella is known to absorb toxins within the intestine and aids digestion. Chlorella is known to boost the immune system. 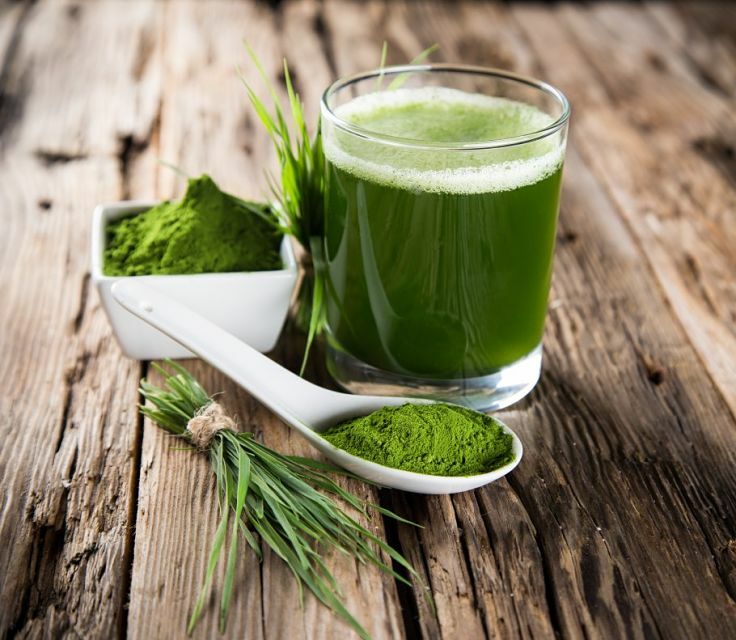 For hypertension, taking chlorella was associated with a lowering of blood pressure in about 50 per cent of cases, and it also significantly lowered blood cholesterol levels. 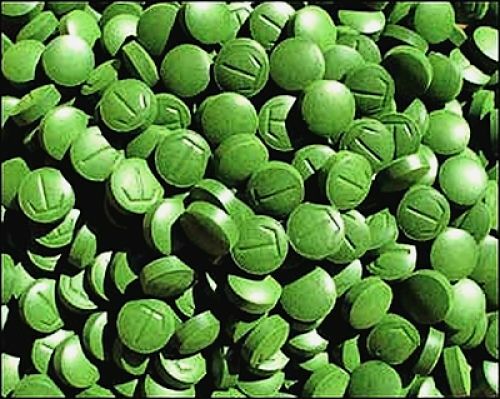 Chlorella helps eliminate waste products, and cleanses the blood, liver and kidneys. Chlorella has been shown to bind to mercury and other heavy minerals and toxins (pesticides) and help remove them from the body. Chlorella can be regarded as a whole food rather than a nutritional extract, because you are eating the whole plant, similar to seaweeds, which are multicellular algae that are related. The dried chlorella powder has concentrated nutritional value similar to the concentration that applies to dried fruits such as sultanas and prunes. Elimination of the water concentrates the nutrients into a smaller volume. Eating one or two teaspoons of the powder in a smoothie, or even sprinkled on your morning cereal is equivalent to the nutrients contained in large servings of dark green leafy vegetables! You may need to mask the strong algae taste with other ingredients. One simple green smoothie recipe combines coconut milk, honey, two raw eggs (or protein powder), one banana, and a spoonful of chlorella. The mixture is combined in a blender or food processor. It's important to look for chlorella products that have broken (or cracked) cell walls. The cellulose walls of the cells can resist breakdown during digestion, stopping all the goodness within the cells being readily available when it is eaten. The table opposite summarizes the nutrients in 100g of Chlorella powder, which is a huge serving. This amount has been used to enable comparisons with nutrients in other foods. While comparing a dried product with fresh foods containing water may be misleading it still provides a guide as to the benefits of replacing some or all of these foods with Chlorella. Calories - The calories are quite high as 411 Calories (1717 Kj) per 100g, which is similar to that for many nuts and breakfast cereals, however about half the calories are in protein. Protein and Amino Acid - The protein content is very high (58 g/100g) and almost two-thirds of the weight is pure protein. The protein concentration is more than twice that of beef and chicken, four times that of eggs and wholegrain wheat and 20 time that in rice and potatoes. The range and concentration of amino acids is very high (see the summary in the table below). Fat - The total fat level is very low at only 9 g/100g. Fiber - The fiber level is high relative to other vegetables such as pumpkin, spinach and carrots. Vitamins - The level of vitamins is very high for most vitamins and is 5-10 times higher than an equivalent weight of spinach, carrots, and pumpkin (see table below). This includes foliate and the B group vitamins. Minerals - All the minerals were more than ten times higher in Chlorella powder - particularly for iron and calcium. Phytonutrients - Chlorella is a rich source of all of the phytonutrients including carotene, Lutein, and Zeaxanthin (see table below).